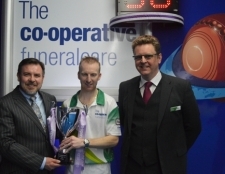 The Co-operative Funeralcare Final between Alex Marshall and Nick Brett was filled to the brim in the arena and the audience were treated to a final of quality bowls though both players did have their off moments throughout the 11 end finals. In set one it was soon apparent that Brett, or the Ginger Ninja, as the audience have dubbed him was really and truly on fire and playing some absolutely incredible bowls making Marshall work so hard to stay with him, and Marshall felt the pressure as Brett just did not let him in and Brett stormed the first set 4-12. Into the second and Marshall had regrouped and made Brett fight for each bowl through to the 4th end where it was all squared at 3 all. In ends 5 and 6 Brett took a single and a double to go 3 up on the match and then Marshall stormed right back at him taking two doubles in ends 7 and 8 to go 7-6 up. Brett stole a single in the 9th to go 7 across and a double in end 10 to go two ahead leaving Marshall looking for a three on the final end, being two down Marshall had his last bowl and played an outstanding bowl to split Bretts away to hold the three he required, Brett had his last bowl and had to draw and again Brett was applauded by the audience as he played a draw bowl to rest just inside Marshall’s to go 1 up and it was game set and match to the Ginger Ninja. 4-12, 8-9. Nick Brett uses Tiger 2 bowls, which are part of the hugely successful Tiger range alongside the Tiger and Tiger Pro.